LG DLEX8000W SteamDryer 9.0 Cu. 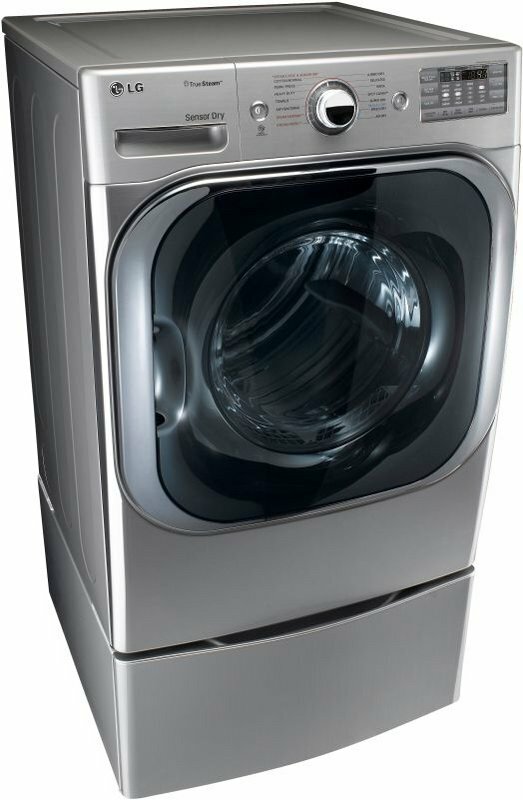 Ft.
Another LG appliance ranked in our top ten dryers. 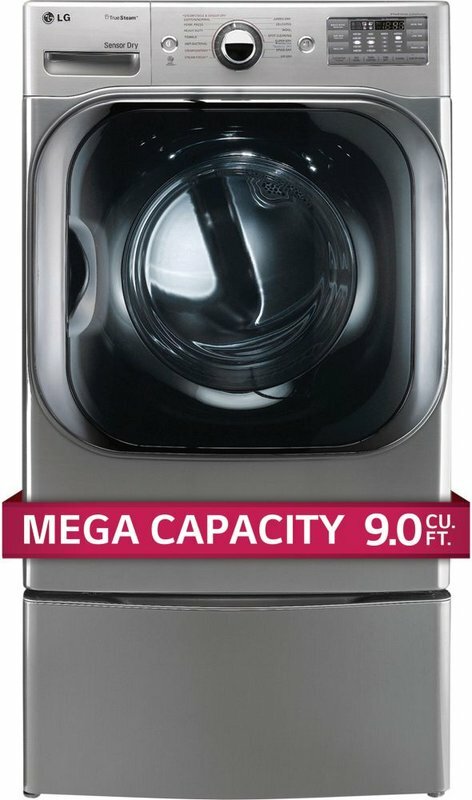 LG DLEX8000W looks like any other dryer from this brand, with one not-so-minor exception: its huge front door. The interior design is whopping – 9.0 cu. ft. Those of you who understand the dryer terms know that 9.0 cu. ft. is huge. Its smart technology is amazing; not only does it dry the loads perfectly, but it also reduces odors and wrinkles and eliminates the need for ironing. The sensor dry system monitors the optimum drying time. Let’s see why this dryer is ranked at #4 in our top 10. Capacity (cu.ft. ): 9.0 cu. ft.
9 cu. ft. Capacity – ultra large capacity that provides room for bigger loads. Sensor Dry System – measures the levels of moisture and automatically adjusts the drying time, meaning your laundry will be perfectly dry. 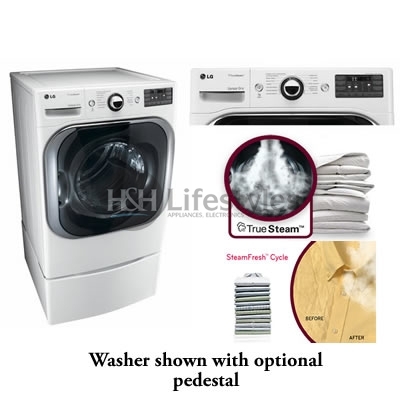 TrueSteam™ Technology – eliminates the need for ironing the laundry and reduces odors and wrinkles. Smart Diagnosis™ – an innovation that helps representatives of customer service efficiently and quickly troubleshoot mechanical problems over the phone. LoDecibel™ quiet operation – you won’t even notice when your dryer is running. 14 drying programs and 12 options – more information on this below. 5 Drying Levels – Damp Dry, Less Dry, Normal Dry, More Dry, Very Dry. Custom Program – saves your favorite dry cycle. SteamFresh™ Cycle – if you don’t have time to iron your outfit for tonight, this cycle will reduce wrinkles and refresh your clothes in a 20-minutes cycle. ReduceStatic™ Option – introduces steam in the cycle’s final 5 minutes to neutralize static electricity. SteamSanitary™ Cycle – safely sanitizes items that are marked as non-washable. FlowSense™ Duct Blockage Sensing System Indicator – alerts you for blocking in the ductwork. EasyIron™ Option – moistens your clothes and makes the ironing more efficient and easier. I couldn’t find a video related to this LG appliance. Comes with a stylish design and great features and performance. With the SteamFresh™ Cycle, your clothes will come out ready to wear. This cycle does wonder. Quiet operation – you won’t notice when it’s working. An amazing investment because it uses less power and less water. Has a child lock and plays a tune when the drying cycle is done. The Spot Clean Feature uses steam and a hot temperature on clothes with fresh stains. The neveRust stainless steel promotes heat insulation and improves rust resistance. Easy to control program – Intelligent electronic controls with dual LED display. Great fabric care features and convenience features. It’s a large dryer, so make sure you measure your room before purchasing. Special fittings and burners must be bought for installing. 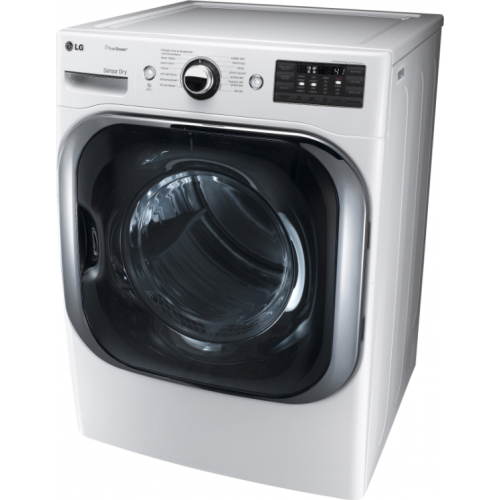 The LG DLEX8000W is one of the best dryers that will fit into your laundry room and your lifestyle. Now you can do more laundry in less time while eliminating the frustration and stress or wrinkles and ironing with innovations like EasyIron and Steamfresh. However, don’t forget to consider its flaws before making the final buying decision.